Well-planned bathroom storage is a key component to keeping your space neat and all your toiletries organized so they are accessible. From toothpaste to lipgloss, there is a storage accessory designed to make sure every item in your bathroom has a home and is easily found. There are many ways to achieve effective storage solutions in your bathroom design, including customized vanity storage, medicine cabinets, shelving, and more. Most of us prefer to store our bathroom supplies out of sight, and enclosed vanity storage is ideal for this purpose. Open shelves or niches can be included for those few decorative items you would like to have on display. Certain items need to be readily accessible in the bathroom, and this is particularly the case when you are in the shower or bath. No one wants to fumble around in the shower for shampoo or soap, and you definitely do not want to have to step out in the middle of your bath to search for a razor. 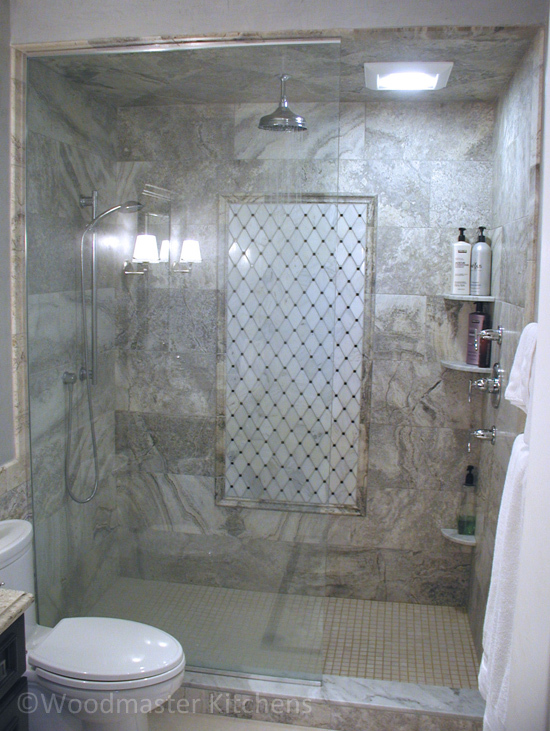 A shower niche built into the tile wall inside your shower is a stylish and practical way to include bathroom storage. From a small niche to a larger area with more than one shelf, these handy nooks provide space for all the items you need readily available in the shower, like the design pictured to the right. Since they are built into the tile wall they are also moisture proof and a seamless component of your bathroom design. If you include a mosaic detail inset or frame the niche in a tile design then this practical storage space can even become an eye-catching feature in your shower design. 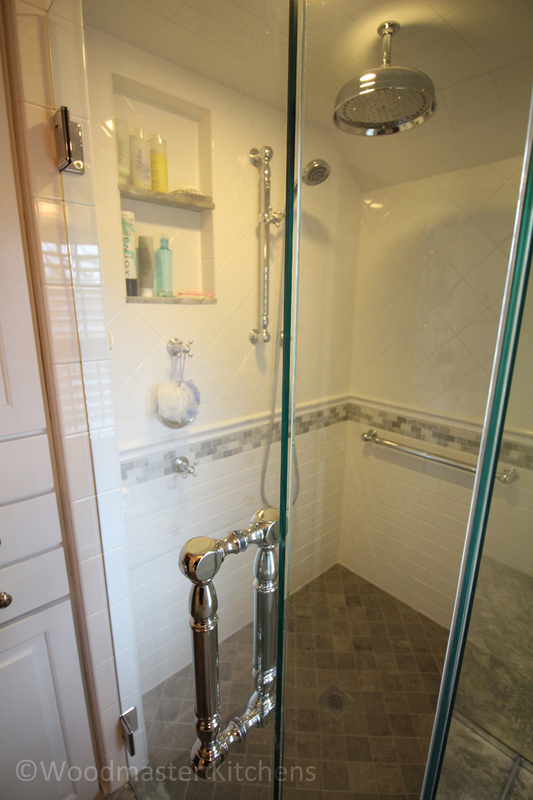 A ledge built into the shower can also be used as a place to keep your toiletries to hand. If the ledge is sized properly and is built at the correct height, like the one pictured below in this bathroom remodeling project, it can also double as a relaxing shower seat. The ledge adds practical storage space and a seat is a luxurious addition to a spa style bathroom, allowing you relax away the stress of the day. The corner of the shower is an ideal place to include handy storage shelves, especially if a recessed niche is not an option in your shower design. Small, rounded shelves built into the corner like those pictured to the right turns an otherwise underutilized space into a perfectly sized location for shampoo bottles and other toiletries. The increasingly popular freestanding tub style can benefit from a built-in ledge for storage when the tub is located near a wall. A ledge built into the wall adjacent to the tub serves as a handy place to keep your bath bubbles and other toiletries. Shelves built in near the tub provide both practical storage and a place to display those items you want everyone to see like decorative bottles or candles. Unlike shower storage that must be water proof, shelves near the tub can be constructed from other materials. For example, wood shelves built into the wall pictured below add an interesting feature to your bathroom design, as well as useful storage. For more innovative storage solutions click to visit our bathroom design gallery or find out how to contact us here.